With turbocharging fast becoming a mainstream powertrain option across all car manufacturers, the Koreans are no different. Kia, in particular, slowly introduced turbocharged petrol engines with their Koup Turbo, but that trickle-down effect eventually made its way to the more mainstream models too. While we won’t be seeing any 1.0-litre turbocharged Picantos anytime soon, the Optima GT has happily transitioned to turbocharging alongside the Sportage. As a D-segment model, the Optima GT has long been a solid left-field contender, although perhaps at this point it may be a little long in the tooth. We say this despite being an entirely new generation, launched just last year and replacing the model that Malaysians may be more familiar with. Has the new powertrain given Kia’s D-segment contender a second wind? 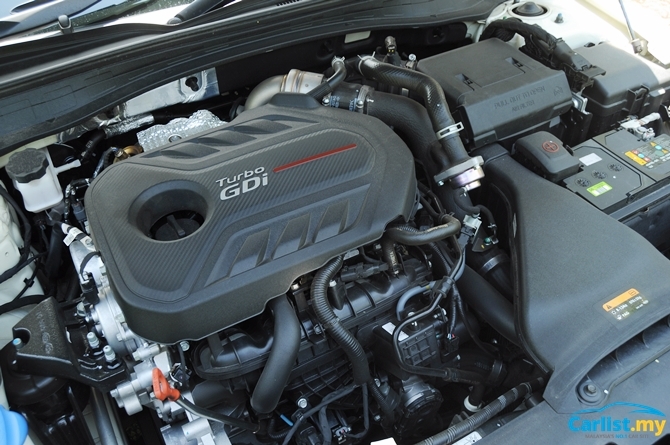 This generation of Kia Optima GT is offered solely with a 2.0-litre four-cylinder turbocharged engine. It’s a fairly powerful mill, with a solid 242 hp and 350 Nm of torque from just 1,400 rpm, up to 4,000 rpm. Paired with a six-speed conventional automatic transmission, this is the kind of formula you would expect to see in a sleeper car of sorts – i.e. the family car that’s deceptively quick. From the previous generation there has been a great deal done on both the outside and in, helping to refresh the looks of the car and use more trendy materials. 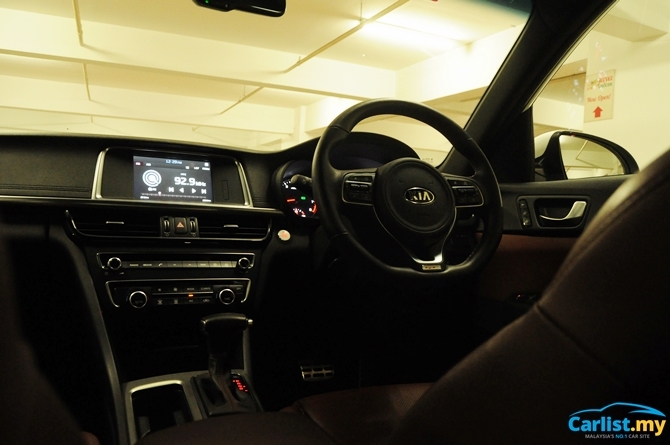 On the whole, the Optima GT has grown a little and this translates to more interior room. Priced at RM 179,888 (at time of testing), the Optima GT sits right in the middle of the segment’s price bracket, being neither as expensive as a top-of-the-line Volkswagen Passat, nor being as budget friendly as a Honda Accord 2.4 VTi-L. That’s not an entirely bad position to be in, as it bridges the gap between conventional powertrains and pure performance and luxury. With Kia, design is constantly evolving with each model launched. There’s no defined line between generations, which can be a little confusing but isn’t any indication of designs being clumsy or poorly thought out. 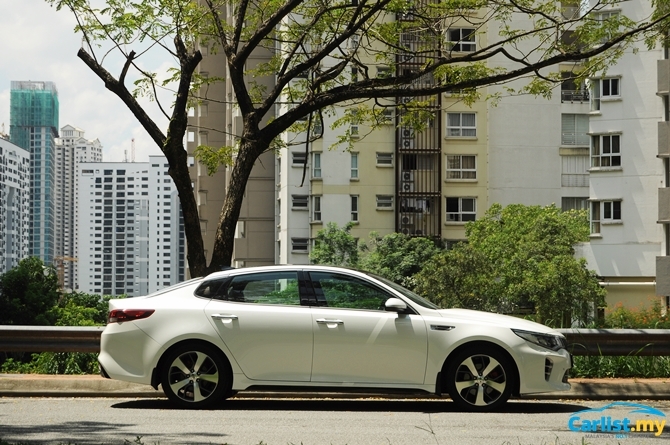 The Optima GT is a handsome car, whether you’re viewing it from head on or from any of the quarter-panel views. Perhaps the only peculiar perspective is when you view it directly from the side, which really gives you an impression of how long the car is. In terms of the actual features on the car itself, the Optima GT carefully blends fluid metal bodywork with sharp elements such as a rear diffuser and both headlights and taillights. 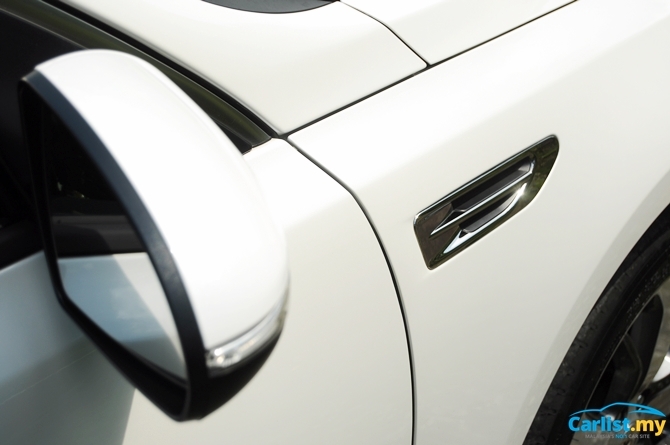 The grill up front has a more seamless blending with the headlights for a truly cohesive design. While the wheels could use a little more offset and a face that isn’t quite so flat, they aren’t be any means a design you couldn’t live with. Perhaps this is the crux of the Optima GT: it doesn’t feel like it has come far enough from the previous generation. We were already fans of the Optima GT of old, but that was at a time when manufacturers weren’t stepping up their game in the department of interior designs. The top-of-the-line Volkswagen Passat comes with a massive LCD screen; one can’t help but wonder when this will be made available on more mass market models. In terms of the actual quality of materials used, Kia has done a great job. It does feel premium to the touch, including the solid build quality and feedback from the switchgear. What lets the Optima GT down is the rather small entertainment unit, which occupies a space flanked by plenty of unused dashboard trim. The usage of black in a singular tone with the Optima GT is common with the outgoing model, though not necessarily a good thing. 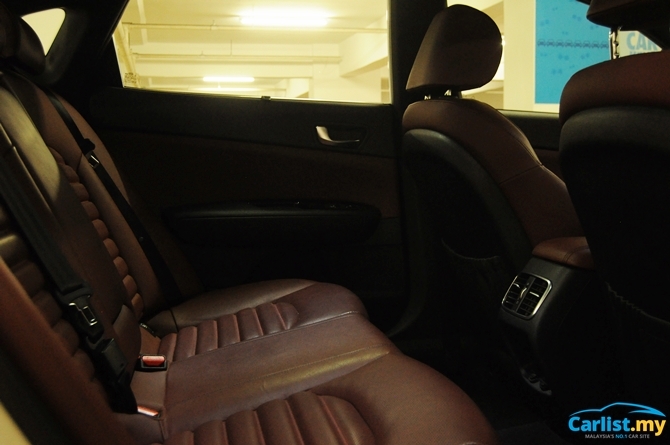 Where the interior does shine, however, is in the sheer room – at least in terms of legroom. Front and rear passengers are hardly ever wanting more, even with four tall occupants. Headroom, however, is a little bit of a sore topic for rear passengers given the taper of the Optima GT’s roof. There are very high expectations when it comes to the Optima GT as class contenders now have to face models like the Mazda 6 as a benchmark for handling performance. Given that it has the most power in class, one would also expect the Optima GT to be quick on the straights as well. Unfortunately, this isn’t quite the case. While the tyres on the Optima GT were incredibly worn during the testing period, the overall characteristics of the car could still be gleamed. One redeeming aspect of the drive experience is the brakes; despite not being particularly fancy or exotic, the brakes on the Optima GT provide more than enough stopping power. In terms of powertrain, the major let-down is arguably the gear ratios. Despite being a modern, functional unit, the gear ratios determine just how well the car will perform. In the case of the Optima GT, there are very long gear ratios which ends up robbing the feeling of acceleration from the rather potent engine. 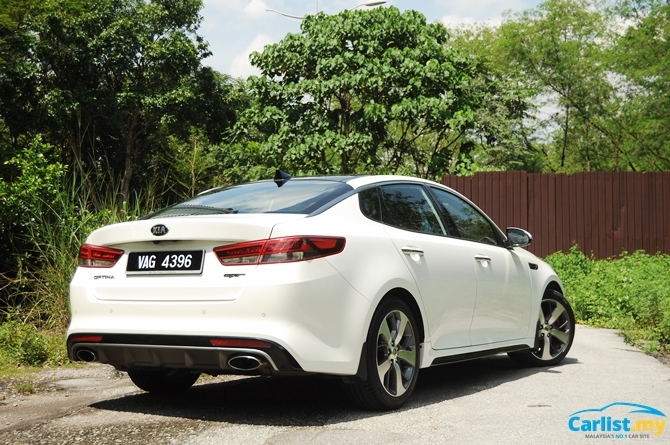 As for handling itself, the Optima GT is far from bad, but neither is it outstanding. The car is long and heavy, making it particularly slow to react to directional changes. A bit of trail braking helps to coax the car into a corner, which is unique for a car these days, but it’s more a workaround than a solution. As mentioned earlier, the Optima GT is spacious and the materials are well selected, but when it comes to ride quality it’s a tale of two cities. For front passengers, the damping is fairly spot on – not quite Lexus levels of smoothness, but nowhere near bone jarring either. 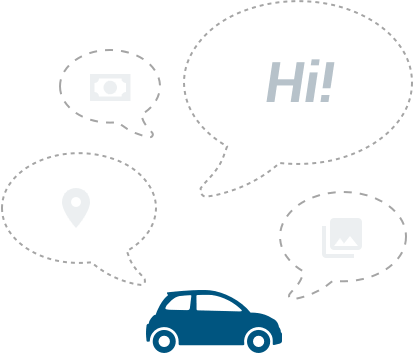 For the rear passengers, as is the case with a lot of cars these days, things are a little less comfortable as undulations and bumps are transmitted directly to the rear seats.  It’s not uncomfortable to the point of being unusable, but more a minor annoyance. Over 162 kilometres of driving, most of it being highway and light traffic, the Optima GT returned 8.6 litres per 100 kilometres. 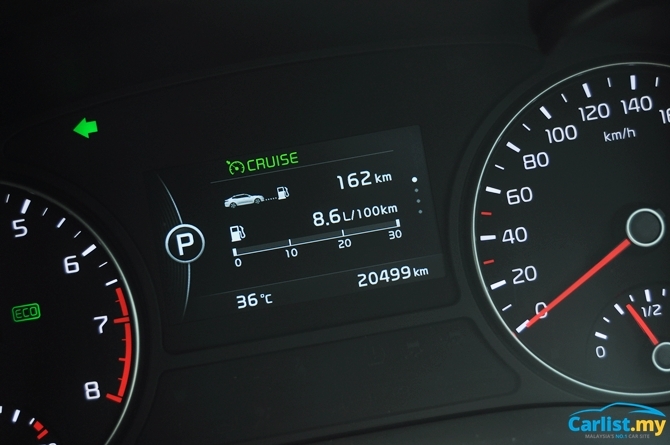 Realistically, however, you are more likely to see that figure go up to around 10 litres per 100 kilometres, depending on the traffic you face and your driving style. Cane it along a back road and you can easily see 14 litres per 100 kilometres – but this isn’t something you’ll be carrying out every day. Even though the powertrain is a little diluted by the ratios, it is still a quick car by any measure and is happy cruising at highly illegal speeds.  That’s the benefit of longer ratios – an engine can maintain lower revs at higher speeds and as such it’s simply a more comfortable car to drive. If you’re one who isn’t likely to fiddle around with the entertainment unit – more a set-up-Bluetooth-and-drive person like myself – then the size of the display isn’t a particular problem. The Optima GT is a car that happily sits in the middle of the pack. Certain things about it are better than the competition, and certain things are lacking. The pricing is highly appropriate when taking these things into consideration, but depending on what you look for in a car the Optima GT may be the most appealing option.